Adrienne Adams (February 10, 1906 - December 3, 2002) was an American children's book illustrator. She won two Caldecott Honors (in 1960 and 1962) and in 1973 she was awarded the Rutgers Award for overall contributions to children’s literature. In 1977, she won a University of Southern Mississippi Medallion. She was born in Fort Smith, Arkansas and grew up in Oklahoma. 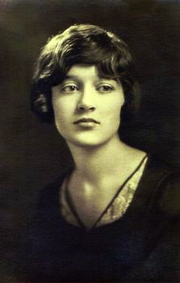 She obtained a BA at Stephens College (where she was awarded the Alumnae Achievement Award in 1964), then attended the University of Missouri before moving to New York in 1929 to study at the American School of Design. Until 1949 she was a free-lance designer of displays, murals, textiles, greeting cards. She married children's book writer John Anderson in 1935 and in 1942 illustrated one of his books, Bag of Smoke, thereby beginning her career as an illustrator. She went full-time as an illustrator in 1952. In total she illustrated more than 30 books, from titles by contemporary authors such as Rumer Godden, Irwin Shapiro and Aileen Fisher to the fairy tales of Hans Christian Andersen and the Brothers Grimm. Adrienne Adams is currently considered a "single author." If one or more works are by a distinct, homonymous authors, go ahead and split the author. Adrienne Adams is composed of 2 names. You can examine and separate out names.